Derivation of scientific nameThe species name is derived from the type locality, which is the Glenlyon Farm in Nieuwoudtville, Northern Cape, South Africa. The Glenlyon Farm was purchased in 2007 by SANBI and now forms the core part of the Hantam National Botanical Garden. South Africa is a centre of diversity for monkey beetles, with more than 65% of the world’s monkey beetle species and 40% of the genera concentrated here. Currently, over 1 040 described species and 51 genera of monkey beetle are known from South Africa. Remarkably, almost half of the world’s species are concentrated in the winter-rainfall region of South Africa, with the Fynbos and Succulent Karoo Biomes being hotspots of monkey beetle diversity, both in numbers of species and in the huge diversity of different shapes, sizes and colour forms. Monkey beetles pollinate many different plant species, especially daisy and bulb flowers. Clania glenlyonensis is a specialized monkey beetle that is endemic to the red dolerite soils of the Hantam National Botanical Garden in Namaqualand. Clania glenlyonensis is a large (8–10 mm long) orange beetle with stiff black hairs. The beetle has a black head and the thorax is black with yellow longitudinal stripes. The elytra (hard wing coverings) are covered in bright orange scales (like a butterfly) with a sparse covering of stiff black bristles. Female beetles are less brightly-coloured, with more of a pale brown-orange colour. The hind-legs are long and black, with male beetles having especially long legs, which they use for fighting with other males for the right to mate with a female beetle. The beetles’ juvenile stage consists of a C-shaped white grub that lives in the soil and feeds on organic matter. The grubs are fat (about as thick as a pencil) and are about 1 cm in length with a small brown head and large jaws. The pupae reside in a small, oval-shaped soil ‘cocoon’, made from the grub’s saliva mixed with grains of soil. Monkey beetles are very good fliers and Clania glenlyonensis is as quick and accomplished at flying as a honeybee, buzzing rapidly from flower to flower. 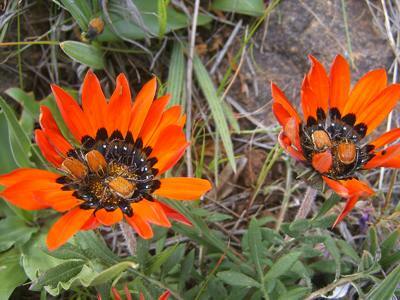 Clania glenlyonensis is endemic to the Nieuwoudtville are in the Northern Cape, South Africa, with almost all collection records from two localities—the Glenlyon Farm (now the Hantam National Botanical Garden) and the Nieuwoudtville Flower Reserve. Clania glenlyonensis is almost exclusively associated with the unique dolerite soil plant communities. The beetle feeds on a range of endemic plant species that are found on the dolerite soils, and they have formed a very close evolutionary relationship with two of these species: Romulea monadelphaand Hesperantha vaginata. Beetles feed mostly on pollen. They will visit a range of flower shapes (daisies, bowl-shaped bulbs) and colours (red, orange, yellow, white). Beetles fly rapidly from flower to flower, eating pollen, and searching for mates. Clania glenlyonensis is an important pollinator for a range of endemic plant species. The beetle’s larvae also serve an important role as decomposers of organic matter in the soil. Several male beetles are often seen wrestling over a female beetle. In this way they get covered in pollen and help to pollinate flowers. Beetles emerge in spring in high numbers and no doubt are an important source of food for birds, other insects and spiders. Beetles take advantage of the mass spring flowers, which offer an abundant source of pollen for beetles to feed on. Clania glenlyonensis will feed on a range of flower shapes and colours and in years of bad rainfall with low numbers of flowers, they are able to utilize a range of available resources. They are also specialized to see the colour red—not many animals or insects can see this colour—so they are able to find and almost exclusively feed off the red-flowered Romulea species that flower in profusion within the beetle’s habitat. The larvae live in the soil and are protected from the harsh dry and hot summers in this protective environment. Larvae will pupate after the first winter rains fall and adults will emerge in time for the spring flower displays. Clania glenlyonensis is a main pollinator of Romulea monadelpha and Hesperantha vaginata within the Hantam National Botanical Garden. It also visits a range of other flowers, and because of its rapid and busy flight, high loads of pollen carried on its hairy body, and large numbers, it is considered a keystone pollinator. The feeding and mating behavior of monkey beetles is interesting and even entertaining to watch. It can be very comical watching male beetles wrestling for the right to mate with a female beetle. Sometimes the female beetle will fly off and the males will continue fighting without realizing that the prize has left! The beetles are very photogenic, with their bright colours and pretty patterns of scales and hairs. Please photograph monkey beetles seen and load the pictures onto iSpot (http://www.ispot.org.za/). This way we can obtain additional information on beetle distributions and host plants. Currently, no species of monkey beetle is Red Listed or has a conservation status. Clania glenlyonensis is protected within the Hantam National Botanical Gardens; however, its other main locality is highly threatened by invasive grass species that are out-competing the beetles host plants. Monkey beetles in general are under threat from habitat loss due to over-grazing and invasive grass species. Additionally, the destruction of road verges throughout Namaqualand is a serious threat to many monkey beetle species. Road verges are often the last remaining habitat for beetles. Currently, over 1 040 described species and 51 genera of monkey beetle are known from South Africa. The next most diverse area is Madagascar with approximately 250 species. 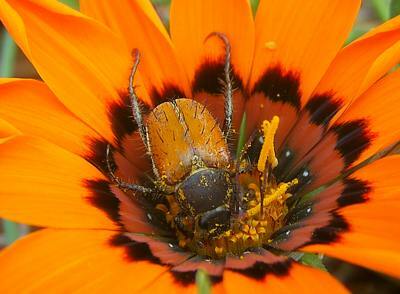 Some monkey beetle species in South Africa, such as from the grasslands of KwaZulu-Natal, do not feed on flowers, but rather on leaves and grasses. Picker, M.D. & Midgley, J.J. 1996. Pollination by monkey beetles (Coleoptera: Scarabaeidae: Hopliini): flower and colour preferences. African Entomology 4,1: 7–14. Goldblatt, P., Bernhardt, P. & Manning, J. 1998. Pollination of petaloid geophytes by monkey beetles (Scarabaeidae: Rutelinae: Hopliini) in southern Africa. Annals of the Missouri Botanical Gardens 85,2: 215–230.